Wake up with semi permanent Make-up! Eyebrow Tattoo procedures are available 5 mins from Adelaide CBD. IS COSMETIC SEMI PERMANENT PIGMENT EYEBROW TATTOO FOR YOU? So many of our MOC clients come to us due to existing eyebrow problems. Have you over plucked your brows? Perhaps your brows look too thin or gappy? Or maybe you have faded brows and scars where the hair has not grown back ? Some clients are just tired of pencilling eyebrow shapes every day. Health conditions or age may reduce natural brow growth also. 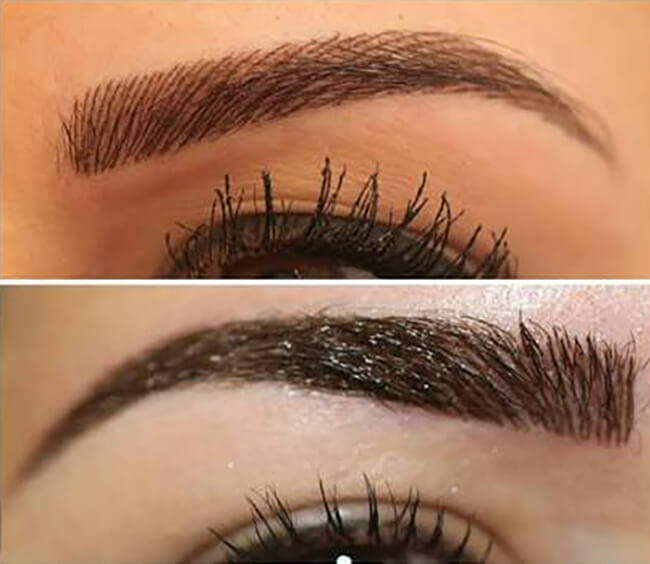 If you have bald patches on your brows or simply would like a more bold and defined look, then Cosmetic Eyebrow Tattoo is for you! 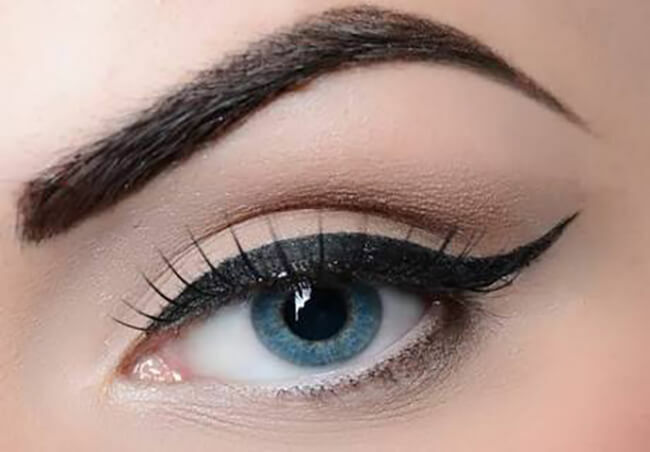 If your brows are too thin, uneven or have gaps, then Feather Stroke brow tattoo is the answer. This method is a semi-permanent eyebrow tattoo technique now replacing the block tattoo technique. Fine hair-like strokes are penetrated into the skin for a realistic hair look finish. The appearance is completely natural looking and blends with or without hair along the brow bone. After 4-6 weeks, a shadow of colour can also be applied to deepen the colour of the brows. If you’re someone who prefers a fuller brow but still wants that soft texture, you may want to consider the powdered technique. The powder technique mimics the appearance of conventional brow makeup whether it be a brow pencil or brow shadow. This technique is a combination of both, it provides longevity and fantastic coverage. The results of all 3 techniques are graceful, clean and natural looking giving you symmetrical eyebrows that are perfectly placed and coloured. Permanent beauty – love it! A unique blend of shaded colour to define the arch and end, with hair strokes to add softness. The Feather Stroke Brow or Nano Brow technique uses a flexible needle (similar to an acupuncture needle) to replicate tiny hair-strokes on the brow. The Ombre Brow technique is similar to the Powder Brow technique. The Ombre Brow incorporates a natural fade with lighter pigment at the start of the brow which gradually becomes darker at the tail. Whilst browsing through the MOC Gallery, please keep in mind that all ‘before and after’ photos are taken immediately after the procedure. Colour is much darker and bolder at that time. This is no indication of what the colour will look like once it has healed. Pigment fades 40% within the first 7 days and the true colour will be visible within 4 weeks. We use semi permanent pigments not ink which will fade naturally over time. We firstly recommend having your brows professionally threaded by our therapist to perfect your brows prior to tattooing. A full consultation to determine the colour and style that suits your needs takes place- we will pencil and outline your brows to a shape that is to your liking. Together we will measure your brows and surgical dots are drawn to ensure symmetry, design and shape creation. Whilst undergoing the procedure, a topical anaesthetic is applied to decrease any pain or discomfort that you may feel. Your pigment colour will then be applied to your skin creating beautiful natural full brows. Finishing off with a soothing lotion to help with your healing process. Depending on the depth of colour requested, most people are comfortable in public within a day or so. A barrier cream such as Bepanthen cream is recommended for daily use for up to 7 days after the procedure. The hypo-allergenic iron oxide pigment is then implanted into the skin and which will generally last between 2-5 years. Results may vary depending on the client’s exposure to sun and their resistance to pigment. Who can benefit from Feather Stroke Cosmetic Tattooing? Cosmetic tattooing will save you time and frustration. 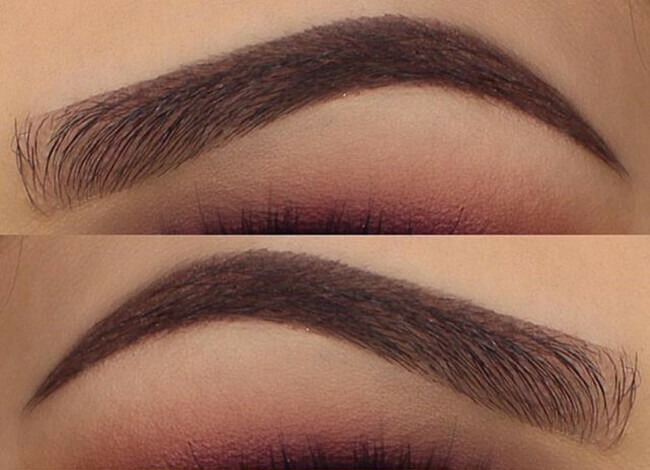 Your brows look great twenty four hours a day and there is no need to draw your eyebrows on anymore. You can swim, sleep, perspire, have a sauna, play sport, wash your hair and still look great. We use disposable needles and sterilisation of equipment. Performed by our resident brow experts you’re in very safe hands. What colour pigments are used? We uses quality pigment lotions based in iron oxide, a safe non-reactive substance. The pigment lotions are specifically manufactured for implantation into human skin. Pigment lotions are inorganic (meaning they are semi-permanent). A powder is suspended into a solution of distilled water and glycerine which results in a smooth creamy liquid. Yes, cosmetic embroidery looks as if you applied a pencil, a little softer and more muted. Immediately after the treatment the colour will appear stronger and darker for the first 7-14 days. After that, you can lose approximately 50-60% of complete colour during the healing process within 7-14 days. The majority of people don’t need to take time off work. There is usually no swelling with the eyebrow treatments but this can vary from person to person depending on levels of sensitivity.